The 232.0.0.0/8 (IPv4) and FF3x::/32 (IPv6) block is reserved for use by source-specific multicast. The prefix holds the binary value 11111111 for any multicast address. Currently, 3 of the 4 flag bits in the flags field are defined; the most-significant flag bit is reserved for future use. The other three flags are known as R, P and T.
Similar to unicast addresses, the prefix of IPv6 multicast addresses specifies their scope, however, the set of possible scopes is different. The 4-bit sc (or scope) field (bits 12 to 15) is used to indicate where the address is valid and unique. ffx1::/16 127.0.0.0/8 Interface-local Packets with this destination address may not be sent over any network link, but must remain within the current node; this is the multicast equivalent of the unicast loopback address. ffx2::/16 224.0.0.0/24 Link-local Packets with this destination address may not be routed anywhere. ffx4::/16 Admin-local The smallest scope that must be administratively configured. ffx5::/16 Site-local Restricted to the local physical network. ffxe::/16 224.0.1.0-238.255.255.255 Global scope Eligible to be routed over the public internet. The service is identified in the 112-bit Group ID field. 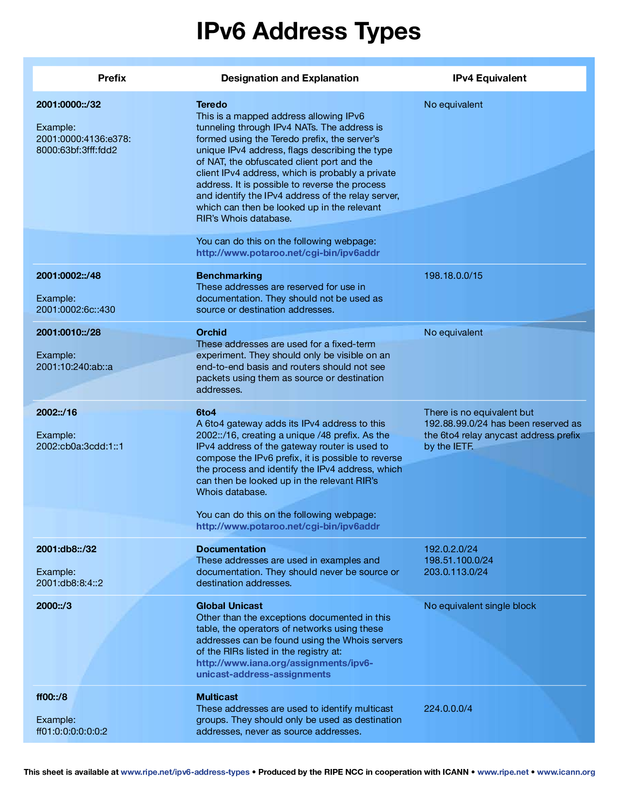 For example, if ff02::101 refers to all Network Time Protocol (NTP) servers on the local network segment, then ff08::101 refers to all NTP servers in an organization's networks. The Group ID field may be further divided for special multicast address types. 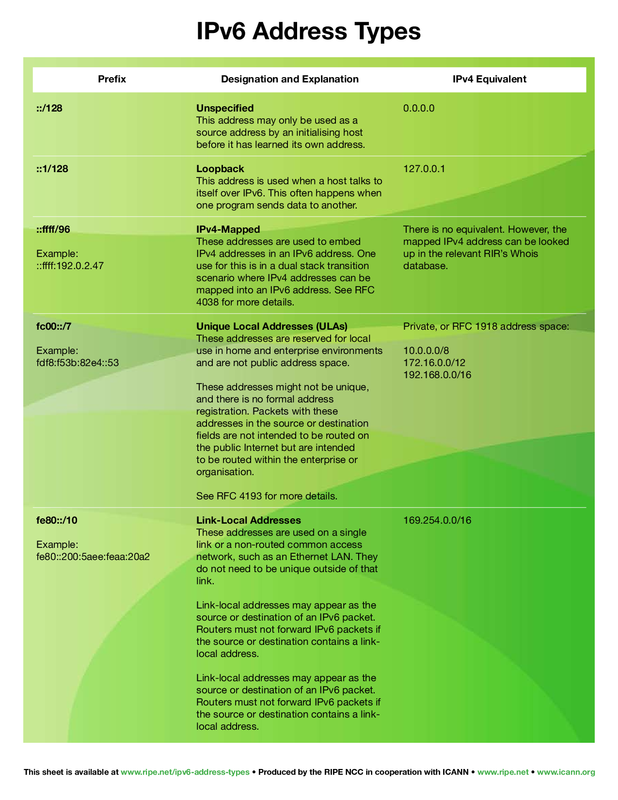 The following table is a partial list of well-known IPv6 multicast addresses that are registered with the Internet Assigned Numbers Authority (IANA).